Fruit or sponge for a Christmas cake? 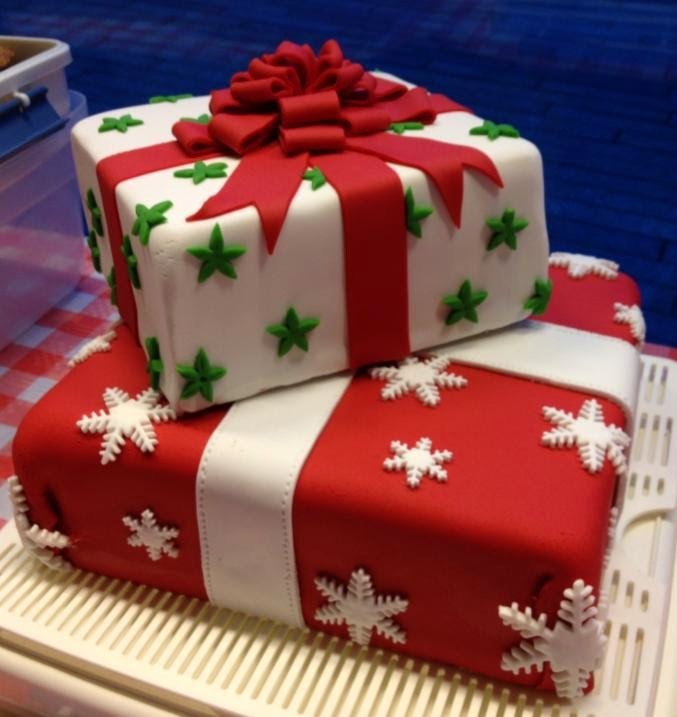 I did this cake as part of our work xmas bake-off. I haven't done a cake this big before and was lucky that the base did manage to fit into my cake carrier (when I took the silver board off anyway). It would have been an awkward moment otherwise. With this cake being for work I took the decision not to do a fruit cake as it's rather rich and many people are not a fan. Instead I did two types of sponge. The top parcel was vanilla genoise cake with strawberry buttercream filling. I cut the cake so it had four layers of sponge to keep it light and to assist with the height. The silver cardboard board was also iced so to be part of the design. The bottom parcel I used chocolate genoise cake with vanilla buttercream filling. Once again I cut the sponge into four layers. The top parcel was 6 inches square and 3 inches high. The bottom cake was 10 inches square and 3 inches high. How do I work out how many portions for an iced cake? One dessert portion is 1 inch by 2 inches so the top layer provided 18 portions and the bottom layer provided 50 portions, that's 68 portions in total.